In a segment on Sunday’s "60 Minutes," anchor Scott Pelley described how "The enemy has killed hundreds of civilians this year, but surprisingly, almost the same number of civilians have been killed by American and allied forces." Pelley focused on U.S. air strikes citing a statistic from the liberal group Human Rights Watch: "So far this year, 17 air strikes have killed more than 270 civilians, according to the humanitarian organization Human Rights Watch." It's been six years since the liberation of Afghanistan, but the fighting there now is the greatest it's been since the start of the war, and more civilians are dying...With relatively few troops on the ground, the U.S. And NATO rely on air power, and civilian deaths from air strikes have doubled. Now, there's concern that those deaths are undermining Afghan support for the war. Of course framing the story in this way followed the typical mainstream media template of suggesting that the war in Iraq has diverted resources from where they are needed and that U.S. actions are a cause of anti-Americanism throughout the world. There were no enemy combatants. It was four generations of one family, all killed in the air strike: An 85-year-old man, four women and four children, ranging in age from five years to seven months. One boy survived. The night of the bombing, seven-year-old Mujib happened to be staying with his uncle, Gulam Nabi. UNKNOWN MAN ( Translated ): During the Russian invasion, we haven't heard of ten members of one family being killed by Russians in one incident. But the Americans did that. PELLEY: These Afghans, like many others, are trying to decide whether to support the U.S. backed government. We expected anger, but we didn't expect this. You can't be saying that the Soviets were kinder to your people than the Americans have been. UNKNOWN MAN B( Translated ): We used to hate the Russians much more than Americans. But now when we see all this happening, I am telling you Russians behaved much better than the Americans. PELLEY: Garlasco says, that before the invasion of Iraq, he recommended 50 air strikes aimed at high-value targets: Iraqi officials. How many high-value targets were taken out in those strikes? GARLASCO: None of the targets on our target list were actually killed. PELLEY: How many civilians were killed in those strikes? GARLASCO: We're looking at...a couple of hundred civilians, at least. PELLEY: A couple of hundred civilians? PELLEY: And not a single bad guy killed? Garlasco also offered the concluding thoughts that "You have to ask yourself, is a mid-level thug worth nine dead civilians? But it goes beyond that....You then take people who maybe were in a pro-government area, and all of a sudden you're turning them against you and turning them towards the Taliban." But Human Rights Watch, which has been investigating Israeli shelling in Gaza, said of the deaths, which occurred at a Gaza beach, "The evidence we have gathered strongly suggests Israeli artillery fire was to blame. "...An American expert working with Human Rights Watch, Marc Garlasco...said that he had visited the beach the day after the explosion, and that the crater size, the shrapnel and the location of injuries on the bodies all pointed to "a shell dropping from the sky, not explosives under the sand." On Monday, Maj.-Gen. Meir Klifi - head of the IDF inquiry commission that cleared the IDF of responsibility for the blast - met with Marc Garlasco, a military expert from the HRW who had last week claimed that the blast was caused by an IDF artillery shell. Following the three-hour meeting, described by both sides as cordial and pleasant, Garlasco praised the IDF's professional investigation into the blast, which he said was most likely caused by unexploded Israeli ordnance left laying on the beach, a possibility also raised by Klifi and his team. 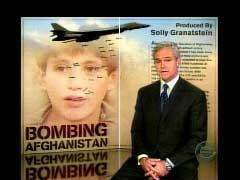 Of course Pelley had no hesitation accepting Garlesco’s analysis of air strikes in Afghanistan. There is one young boy who is the sole survivor from that house, a seven-year- old boy named Mujib. We asked him what he thought of the Americans. And as you might expect, he said, "I hate them." SCOTT PELLEY: You are asking the American government to roll back the air strikes. Do I understand you? HAMID KARZAI: Absolutely, oh, yes, in clear words. PELLEY: Afghanistan's president is talking about American air strikes that have killed nearly 300 civilians this year. How does it happen? We found answers in this secret Air Force control center that's never been seen on television before tonight. We can't tell you where it is, but we can tell you that every mission over Iraq and Afghanistan is run from here. And what are all those points on the map? GARY CROWDER: The points on the map, each one of those is an individual aircraft. SCOTT PELLEY: It's been six years since the liberation of Afghanistan, but the fighting there now is the greatest it's been since the start of the war, and more civilians are dying. The enemy has killed hundreds of civilians this year, but surprisingly, almost the same number of civilians have been killed by American and allied forces. With relatively few troops on the ground, the U.S. And NATO rely on air power, and civilian deaths from air strikes have doubled. Now, there's concern that those deaths are undermining Afghan support for the war. We took a closer look at one American air strike from last spring. At the time, the Army said that there were unconfirmed reports that nine people died in a battle with the enemy. But when we asked for more information, the Army wouldn't tell us anything else, so we went to see for ourselves. Our journey took us through Afghanistan up the Shomali plain, north of the capital, Kabul. The Taliban are active here, so we hired Panjshiri mercenaries to cover our trip. The scene of the air strike is a village in the hills above Kapisa Province. We found the dead buried in a cornfield. There were no enemy combatants. It was four generations of one family, all killed in the air strike: An 85-year-old man, four women and four children, ranging in age from five years to seven months. One boy survived. The night of the bombing, seven-year-old Mujib happened to be staying with his uncle, Gulamn Nabi. GULAMN NABI ( translated ): Some of the bodies were missing a hand or a leg or half a head. We recognized one of them only by the clothes she was wearing. PELLEY: And who was the person you recognized? NABI: It was Mujib's mother. MUJIB ( translated ): I saw my mom, my sisters, and my brother and my grandfather were dead. And our house was destroyed. PELLEY: Mujib's father was not there. He's accused of being a local Taliban leader. The U.S. Has been searching for him, with no luck. The air strike came the night of March the 4th. An Army press release says it started after enemy forces fired a rocket at this U.S. Base above the village. The rocket fell, causing no coalition casualties; in fact, missing the fire base altogether. Then U.S. pilots saw two men with AK-47 rifles leaving the scene of the rocket attack and entering a compound in the village. The fort, which is on the hill over there, began raining down mortar fire on this location, mortar fire that came down for about an hour. It was night time, and even though there were no U.S. forces in contact with the enemy on the ground, a decision was made after the mortars to call in an air strike. U.S. Air force aircraft dropped two bombs on this neighborhood, each one weighing 2,000 pounds. This is what it looks like when a ton of high explosives hits a house made of mud. The bombs hit their intended targets. But when the smoke cleared, there were no men with rifles, just Mujib's family. PELLEY: Really, there's no comparison. The Soviets killed something like a million Afghans over ten years. But it's the kind of thing that Afghans are saying and here's why: So far this year, 17 air strikes have killed more than 270 civilians, according to the humanitarian organization Human Rights Watch. It leaves Afghan President Hamid Karzai explaining to his people why they're being killed by his allies. Why are so many Afghan civilians being killed by U.S. forces? HAMID KARZAI: The United States and the coalition forces are not doing that deliberately. The United States is here to help the Afghan people. The Afghan people understand that mistakes are made. But five years on, six years on, definitely, very clearly, they cannot comprehend as to why there is still a need for air power. PELLEY: You are asking the American government to roll back the air strikes. Do I understand you? KARZAI: Absolutely. Oh, yes, in clear words. PELLEY: Karzai told us he delivered those words privately to President Bush in August. But he decided to take the message public in this interview. KARZAI: And I want to repeat that-- alternatives to the use of air force. And I will speak for it again through your media. PELLEY: We wanted to understand how these air strikes are planned. It turns out the mission that made Mujib's neighborhood look like an ancient ruin was run through this futuristic classified control center. We were surprised to get in here because it's never been seen on television before tonight. We promised the Air Force we wouldn't reveal classified information, or the Persian Gulf country where the center is located. Wow, this is Iraq over here and Afghanistan there? PELLEY: And what are all those points on the map? CROWDER: The points, each one of those is an individual aircraft. PELLEY: Air Force Colonel Gary Crowder is Deputy Director of the Combined Air Operations Center, which runs the air war over both Afghanistan and Iraq. You know, I'm curious -- how often is an air strike prepared that's called off at the last minute? CROWDER: Thousands and thousands of times a month. We look... very, very often, we track some of the insurgent leaders, we will track for days and days on end. And we are prepared to strike them at any moment. But we can never get all of the criteria necessary to meet our rules of engagement. PELLEY: We learned there are two kinds of targets: Deliberate targets, which are analyzed for days and watched for patterns of civilians coming and going; and then there are immediate targets, such as when troops are in combat and need air support. In both cases, civilian casualties are estimated in advance, and it's up to the commander on the ground to decide whether the strike is worth the cost. CROWDER: We rely on those commanders to make the assessment at the time of what the requirement is. He assesses proportionality. He assesses the validity of the military target. PELLEY: What do you mean by proportionality? CROWDER: If we know that there is a sniper on a roof and the roof is in the middle of a Mosque or a -- which is a protected site -- or in the middle of a very populated area, then dropping a 2,000-pound weapon on that would not be proportional to going after the sniper. PELLEY: Two men with AK-47s run into a house. Do you bomb the house? CROWDER: In some circumstances, we will bomb the house. It is entirely dependent upon the circumstances on the ground and the ground commander's assessment of that particular situation. MARC GARLASCO: There's this macabre kind of calculus that the military goes through on every air strike, where they try to figure out how many dead civilians is a dead bad guy worth. PELLEY: Marc Garlasco knows the calculus of civilian casualties as well as anyone. At the Pentagon, he was chief of high-value targeting at the start of the Iraq war. He told us how many civilians he was allowed to kill around each high-value target-- targets like Saddam and his leadership. GARLASCO: Our number was 30. So, for example, Saddam Hussein. If you're going to kill up to 29 people in a strike against Saddam Hussein, that's not a problem. But once you hit that number 30, we actually had to go to either President Bush or Secretary of Defense Rumsfeld. PELLEY: The bombs that are dropped are really only as accurate as the intelligence behind them. CROWDER: That's true, but we have come a very long way in getting that intelligence to be more accurate. We will collect human intelligence, signals intelligence, overhead full-motion video, all of that tied together, very often in real- time. That gives us a better understanding and a significantly higher confidence that the targets we're engaging are, in fact, valid military targets. PELLEY: Of course, the Taliban are killing civilians too -- targeting them deliberately. By contrast, we watched American airmen calculate how to minimize civilian casualties with the choice of timing, weapon, and direction of attack. GARLASCO: I don't think people really appreciate the gymnastics that the U.S. military goes through in order to make sure that they're not killing civilians. PELLEY: If so much care is being taken, why are so many civilians getting killed? GARLASCO: Because the Taliban are violating international law and because the U.S. just doesn't have enough troops on the ground. You have the Taliban shielding in people's homes. And you have this small number of troops on the ground, and sometimes the only thing they can do is drop bombs. PELLEY: But why were bombs dropped on Mujib's house? As we said, the Army wouldn't talk about it. An Air Force source says that Mujib's house was a Taliban hideout. But through an interpreter, the villagers disputed that, and they said the U.S. should have known better. UNKNOWN MAN C( Translated ): The Americans came here the day before they bombed. They searched the whole house and saw women and children in the house. PELLEY: This is such an important point. Let me make sure I've got this. Who came the day before? MAN C( Translated ): The Americans. PELLEY: We took their accusation to the military, and an Air Force source confirmed that U.S. troops searched the house the day before. We don't know what those troops may have seen or reported. Marc Garlasco left the Pentagon in 2003 to become senior military analyst at Human Rights Watch. He's examined this case, and he told us that, even if Mujib's father was a local Taliban leader, the air strike backfired. GARLASCO: You have to ask yourself, is a mid-level thug worth nine dead civilians? But it goes beyond that. You're not talking about just losing nine dead civilians. You're also talking about violent protests throughout the country requesting a democratically elected government be taken down. You then take people who maybe were in a pro-government area, and all of a sudden you're turning them against you and turning them towards the Taliban. PELLEY: To return just for a moment to the bombing at Kapisa-- a rocket was fired at a U.S. base there. It missed. No one was hurt. And yet the response was to drop 4,000 pounds of explosives on that neighborhood. PELLEY: They hit what they were aiming at. KARZAI: That is a mistake. I know that. It may be at times careless -- a careless mistake, but not deliberate. PELLEY: There is one young boy who is the sole survivor from that house, a seven-year- old boy named Mujib. We asked him what he thought of the Americans. And as you might expect, he said, I hate them. PELLEY: That doesn't bode well for the future. KARZAI: Yeah, it doesn't. That's why... that's why I'm so strongly asking for a rethink of the use of air force. And this little boy I will call to my office. And I will share his pain with him, as do the rest of the Afghan people, and try to get him a future.